I have to say that out of all the major sports, the NBA is easily my least favorite league. 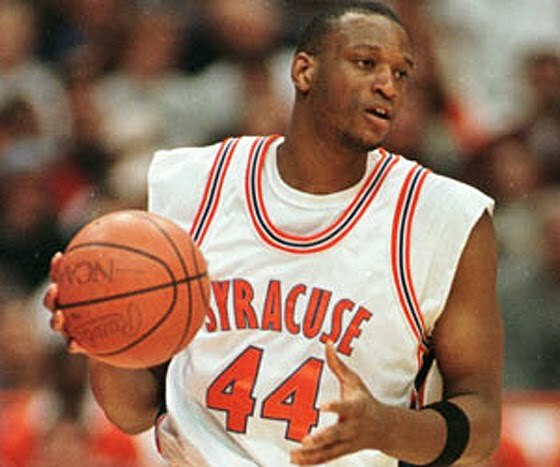 I have, however, been a Knicks fan ever since they drafted one of my favorite Syracuse alums ever in 1996: John Wallace. Putting him on a team with Patrick Ewing, who was always a favorite of mine in “NBA Jam”, really sealed the deal and made me a Knicks fan for the next 15 years. There hasn’t been much for Knicks fans to cheer about over the last decade. They haven’t been to the playoffs since 2004 when they were swept in the 1st round by the New Jersey Nets and haven’t had 40 or more wins since 2000. But all that has been forgotten at least for today (and probably the next few days) as Brooklyn native Carmelo Anthony has returned home in the most highly anticipated blockbuster trade this season and, arguably, in Knicks history. As a Syracuse fan first and a Knicks fan second, I love this trade. When Carmelo was drafted 3rd overall by the Nuggets in 2003 (what were you thinking taking Darko Milicic 2nd Detroit? ), I started following the Nuggets and rooting for them out West. I was glad to see the franchise go further than it had ever been with Anthony at the helm by getting to the Western Conference Finals in 2009 only to fall to the eventual champion Los Angeles Lakers. 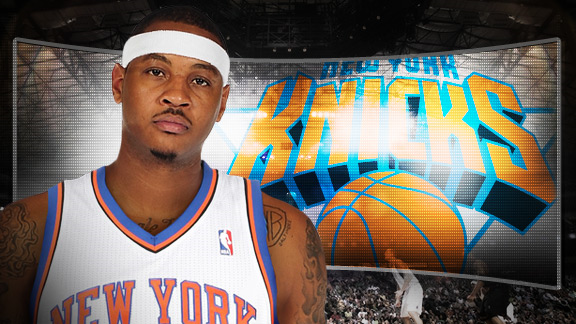 Carmelo is one of the best players and shooters in the game. Simply put he’s a superstar. A superstar who will bring his skills, and seven consecutive playoff trips, to Madison Square Garden and probably extend his playoff streak to 8 years. I do have to wonder, though, why there are so many people out there against this trade. I’m not denying that the Knicks had to part with some serious assets, but I absolutely think it was worth it. This is how I see it: the Knicks have made it known ever since they brought Donnie Walsh into the fold that they wanted to rebuild this team with superstars. Out of the 6 players the Knicks shipped out in this deal, only Danilo Gallinari has an outside shot of becoming half the superstar Carmelo is, according to most pundits. And Gallinari even said back in November that he didn’t think he had “those abilities”. If you consider the contract situations of all of the players leaving New York, the deal makes even more sense. Wilson Chandler’s contract was up after this season and after averaging over 16 points and nearly 6 rebounds a game this season, he was in line for a big raise. So too were Gallinari and Raymond Felton, who is having his best season as a pro largely due to Mike D’Antoni’s system. Don’t forget that Felton was only supposed to be a rental point guard until Deron Williams and Chris Paul become free agents in 2012 when the Knicks will try to complete their quest for a trio of superstars. So yes, the Knicks sacrificed depth in this deal, but you have to give a little to get a little. That depth was nice and fun to watch but it only amounted to a 28-26 record and little chance of beating the best the Eastern Conference has to offer. Now they hit the floor with Chauncey Billiups at the point (and his 7 conference final appearances, NBA title, and countless clutch shots), beloved rookie sensation Landry Fields, Carmelo Anthony, Amare Stoudemire and Ronny Turiaf. A far more formidable starting lineup than they’ve had at any other point this season. One thing is for sure, the trade has Knicks fans excited again about the present and future. 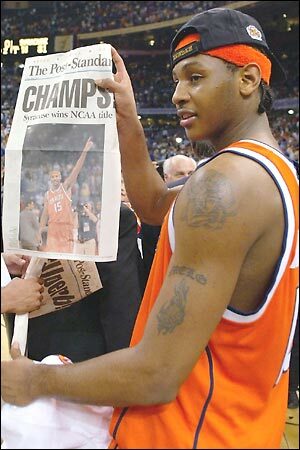 And who knows, maybe Carmelo will be able to bring a championship to another New York institution like he did back in April of 2003. Here’s hoping. Best. NCAA Basketball Game. Ever. This entry was posted in Sports and tagged Amare Stoudemire, Carmelo Anthony, Chauncey Billups, Chris Paul, Danilo Gallinari, Darko Milicic, Denver Nuggets, Deron Williams, Donnie Walsh, John Wallace, Landry Fields, New York Knicks, Patrick Ewing, Raymond Felton, Ronny Turiaf, Syracuse Basketball, Wilson Chandler. Bookmark the permalink.